The Baraboo Cemetery Association was formed on August 11,1855 when burials from three other Baraboo cemeteries were consolidated on Walnut Hill’s ten acre site. George W. Brown (d. 1847) Original founder of Baraboo. William H. Canfield (1819-1913) Sauk County's first surveyor and earliest historian. John Duckins (d. 1894) A runaway slave from Kentucky. Roseline Peck (1808-1899) The first white woman to settle in the Baraboo valley and a celebrated pioneer. Al. Ringling (1852-1915) Eldest of the five famed Ringling Brothers. 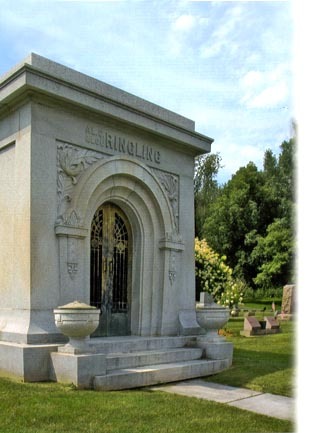 The masoleum is built of Vermont granite - the top slab weighs 12 tons!